Part of Hikvision’s 2-Line range of cameras, the HIK-2CD2T22WD-I4 is an outdoor EXIR bullet network camera that produces exceptional full-HD 1080p real-time video. Providing an ideal combination of features and affordability, this camera includes 120dB true wide dynamic range and supports H.264+ intelligent compression which allows output of an incredibly well balanced image and reduces bandwidth/storage requirements by up to 50%. With inbuilt EXIR technology delivering unparalleled clarity at night for up to 50m and with a 4mm fixed lens, this camera is great for covering a wide area so you can focus on the detail you really want. Part of Hikvision’s 2-Line range of cameras, the HIK-2CD2T22WD-I6 is an outdoor EXIR bullet network camera that produces an exceptional full-HD 1080p real-time video. Providing an ideal combination of features and affordability, this camera includes 120dB true wide dynamic range and supports H.264+ intelligent compression which allows output of an incredibly well balanced image and reduces bandwidth/storage requirements by up to 50%. With inbuilt EXIR technology delivering unparalleled clarity at night for up to 50m and with a 6mm fixed lens, this camera is best suited for focusing in on a specific area from a short distance. 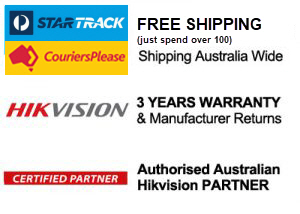 Hikvision’s HIK-2CD4A26FIZ 2MP outdoor bullet camera is part of the Darkfighter range of ultra low light cameras. Being optimised for low light conditions allows this camera to produce clear and crisp images at even the lowest light levels. In addition to giving a better image, the absence of noise in the picture provides benefits and features that include less network bandwidth and storage being required. This camera also offers full HD1080p video at 50FPS. Part of Hikvision’s 2-Line range of cameras, the HIK-2CD2T42WDI86 is an outdoor EXIR bullet network camera that produces an exceptional 4MP high resolution video. Providing an ideal combination of features and affordability, this camera includes 120dB true wide dynamic range and supports H.264+ intelligent compression which allows output of an incredibly well balanced image and reduces bandwidth/storage requirements by up to 50%. With inbuilt EXIR technology delivering unparalleled clarity at night for up to 80m and with a 6mm fixed lens, this camera is great for covering a wide area so you can focus on the detail you really want. 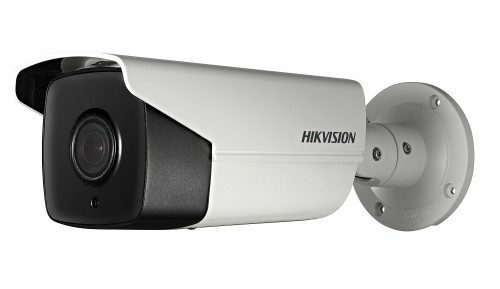 Part of Hikvision’s 4-line Darkfighter range of cameras, the HIK-2CD4A26FWIZ8 is a bullet camera with industry leading sensor technology and image post-processing. It can cope with ultra-low light conditions and produces an exceptional 2MP high resolution colour video down to 0.002 lux. Coupled with inbuilt EXIR technology delivering unparalleled clarity at night for up to 50m and with a 8-32mm auto-focus lens, this camera is great for covering a wide area so you can focus on the detail you really want. Additionally, it also includes built-in smart analytics* which allow for efficient pre and post event detection. The DS-2CD2022WD-I4 is a compact outdoor IR bullet network camera that produces exceptional full-HD 1080p, real-time video with a 4mm only lens. Providing an ideal combination of features and affordability, this camera includes 120dB true wide dynamic range and supports H.264+ intelligent compression which allows output of an incredibly well balanced image and reduces bandwidth/storage requirements by up to 50%. With inbuilt IRs providing up to 30m visibility at night and a 4mm fixed lens, this camera is great for covering a wide area so you can focus on the detail you really want. Part of Hikvision’s 4-Line Darkfighter range of cameras, the HIK-2CD4A26IZHS2 is a bullet camera with industry leading sensor technology and image post-processing ability. it produces an exceptional 2MP high resolution colour video in ultra-low light conditions. Coupled with inbuilt EXIR technology delivering unparalleled clarity at night for up to 50m and with a 2.8-12mm auto-focus lens, this camera is great for covering a wide area so you can focus on the detail you really want. Additionally, it also includes built-in smart analytics which allow for efficient pre and post event detection. Part of Hikvision’s 4-Line Darkfighter range of cameras, the HIK-2CD4A26IZHS8 is a bullet camera with industry leading sensor technology and image post-processing ability. It can cope with ultra-low light conditions and produces an exceptional 2MP high resolution colour video down to 0.002 lux. Coupled with inbuilt EXIR technology delivering unparalleled clarity at night up to 50m and with an 8-32mm auto-focus lens, this camera is great for covering a wide area so you can focus on the detail you really want. Additionally, built-in smart analytics* allow for efficient pre and post event detection.